Aims and Objectives: The nickel–titanium multifile system is a viable tool in shaping severely curved canals as it reduces instrumentation errors. To eliminate the drawbacks with multifile systems, single-file systems were introduced. In this in vitro study, two single-file systems, One Shape and WaveOne, which work in a rotating and reciprocating motion, respectively, were compared with multifile systems for their efficiency in shaping severely curved mesial canals of extracted mandibular first molars, using cone-beam computed tomography (CBCT). Methodology: Fifty-two intact mesial roots of mandibular first molars with severely curved canals were selected using CBCT and divided into four groups of 13 samples each. Samples in Groups I, II, III, and IV, were instrumented using One Shape, WaveOne, ProTaper, and H and K-files, respectively. All the specimens were prepared up to working length to size 25 file using the manufacturer recommended technique along with standardized irrigation protocol. 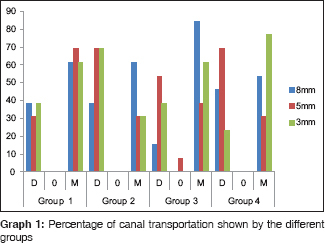 Pre- and postinstrumentation CBCT images were assessed at 8 mm, 5 mm, and 3 mm from apex to compare the changes in canal transportation (CT), canal centering (CC), and remaining dentin thickness. Results: All the groups showed CT with the statistically significant difference between the groups (P < 0.05). Except for ProTaper group at 5 mm (P < 0.05) none of the file systems showed CC. Except for Group I, a significant reduction in dentin thickness was noticed in Group II, III, and IV (P < 0.05). Conclusion: Among the two single-file systems compared, One Shape file in rotating motion prepared canals with fewer changes in canal anatomy than WaveOne file in the reciprocating motion. Endodontic therapy involves a sequence of procedures for treating vital and nonvital dental pulp. It helps the patients to retain and prolong the life of their natural teeth in form, function and esthetics., Among the different factors for successful root canal therapy, shaping and cleaning of the canals have a major role in reducing the microbiota and preparing the canals in such a manner that the original canal anatomy is preserved., Stainless steel (SS) instruments are an indispensable part of root canal instrumentation procedure. But while instrumenting curved canals, they can cause procedural errors and also remove dentin excessively which can lead to weakening of the tooth structure. In order to avoid the instrumentation errors in curved canals, nickel–titanium (NiTi) hand and rotary files were introduced. This study was done, to compare and assess the efficiency of two single file systems, One Shape rotary file and WaveOne reciprocating file, for the CT, canal centricity and RDT after instrumentation from severely curved mesial root canals of extracted lower first molars using CBCT. Protaper universal multifile system which has been used over the years was used as positive control and Hand K-file system was used as negative control for this study. The study design was approved by the Institutional ethics committee of Pushpagiri College of Dental Sciences, Thiruvalla, Kerala, India (#PCDS/IEC/S13/12/14). One hundred freshly extracted mandibular first molar teeth were collected, disinfected in 5.25% sodium hypochlorite (Prime Dental Products, India) for 30 min and stored in 0.9% normal saline (Fresenius Kabi, India) for 7 days. All the teeth were mounted on occlusal rims made in modelling wax (Maarc, India) and subjected to CBCT (Sirona Orthophosphos XG, France) scanning using i-CAT CBCT scanner at 120 kV, 5 mA, 26 s of exposure time, a field of view 80 mm, and voxel size 0.125 mm. The software used for the image analysis was Galileos. Fifty-two teeth with two intact mesial canals with fully formed apex and a canal curvature ranging between 20° and 35° was selected using Schneider's method after the image analysis. For Schneider's method, two lines were drawn on the mesial root canals. The first line was drawn parallel to the long axis of the mesial root canal and the second line was drawn from the apical foramen of mesial root to intersect the point at first line where the canal deviated from long axis. The angle formed in between was measured to detect the curvature. Selected specimens were decoronated at the cementoenamel junction, and then the mesial root was separated from furcation using a diamond disc (No. B.19D/20, Moon dental, China). Patency was established in mesiobuccal (MB), mesiolingual (ML) canals of all the samples using No. 10 K-file (Dentsply Maillefer, United States) and working length (WL) was kept 1 mm short of the apex. MB and ML canals were enlarged circumferentially using No. 15 size K-files (Dentsply Maillefer, United States). Glyde (Dentsply Mailefer, Switzerland) was used as lubricant during instrumentation. Irrigation was done using 2 ml of 17% EDTA (Anabond Stedman, Pharma research, India) for 1 min followed by a final flushing with 3 ml of 3% sodium hypochlorite (Hyposol, Prevest Denpro, India) solution. The apex of the samples was sealed using composite resin (Filtek 3M ESPE, USA) and the root surfaces were covered in silico ne impression material (3M ESPE, Korea) and embedded in autopolymerizing acrylic resin mold (DPI, Apexion dental products, India). Specimens were divided into four equal groups. One Shape files (Micro-Mega, France) with 6% taper and a tip diameter of 0.25 mm was used for instrumentation using in and out pecking motion in Endomotor (X Smart Plus, Dentsply, Germany) at 400 rpm and 2.5 Ncm torque. Instrumentation was completed in three consecutive steps. In the first step, the file was introduced into canal 6 mm short of the WL followed by recapitulation with No. 10 file and irrigation. The file was cleaned and reintroduced to canal 3 mm short of the WL followed by recapitulation with No. 10 file (Dentsply Maillefer, United States) and irrigation in the second step. The file was cleaned and introduced up to the WL to complete the instrumentation followed by irrigation in the third step. WaveOne primary files (Dentsply Maillefer, Switzerland) with 8% taper and tip diameter of 0.25 mm was used for instrumentation using slow in and out pecking motion in a reciprocating endomotor (X-Smart Plus, Dentsply, Germany) at 300 rpm and 5 Ncm torque. Instrumentation of canals was completed in three consecutive steps. In the first step, the file was inserted up to the cervical third of canals, withdrawn, and irrigated. In the second step, the file was inserted up to the middle third, withdrawn, and irrigated. In the third step, instrumentation was completed by inserting the file up to WL followed by irrigation. Instrumentation was done using ProTaper universal files (Dentsply Maillefer, Switzerland) in endomotor (X-Smart Plus, Dentsply, Germany) at 250 rpm and 5 Ncm torque. Files SX, S1, S2, F1, and F2 (tip diameter 0.25 mm) were used in sequences for the instrumentation. SX file was used to enlarge the cervical third of the canal followed by irrigation. Middle third of canals were prepared using shaping files S1 and S2 followed by irrigation. Apical third was prepared using F1 and F2 files up to WL, followed by irrigation. Canals were prepared in the crown-down pressureless technique using SS hand K-files (Dentsply Maillefer, United States). After establishing the provisional WL, coronal third of canals were enlarged sequentially using Gates Glidden drills (Mani, Japan) of sizes no. 1, no. 2, and no. 3. After establishing WL, #45 size SS hand K-file was used with no apical force and reaming motion was employed to enlarge canal, followed by the incrementally smaller sized files #40, #35, #30, and #25 progressing deeper into the canal. In the final step, the apical area was further enlarged to three sizes larger than the first file that bound at their WL. Irrigation was done during the change of files. All the specimens were scanned using CBCT after instrumentation using the values as set before. 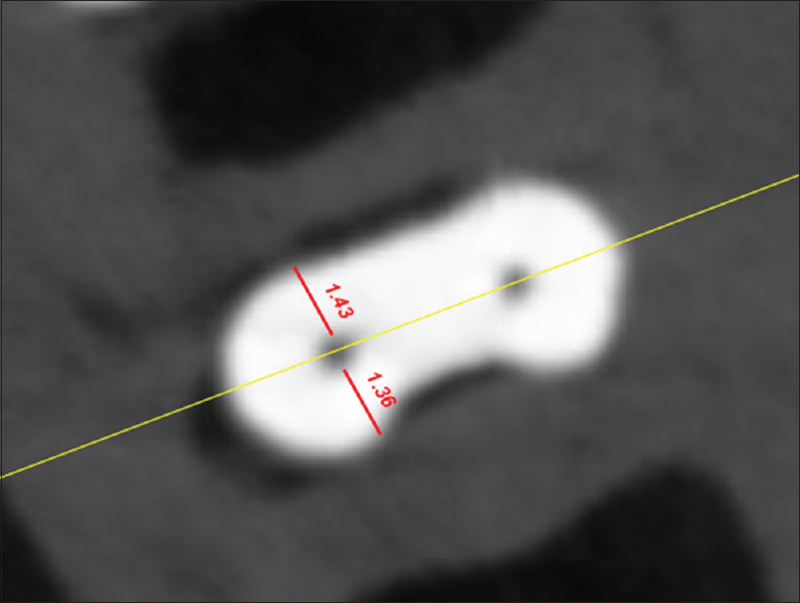 Parameters evaluated were degree of CT, Canal centricity (CC), and RDT using Gambill's method. Values were detected from coronal-third (8 mm from apex), middle-third (5 mm from apex), and apical-third (3 mm from apex) from all the test specimens. CT was calculated [Figure 1] and [Figure 2] using the following equation: CT= (M1 − M2)−(D1 − D2) where M1 is the shortest distance from the mesial edge of the root to the mesial edge of the uninstrumented canal and M2 is the shortest distance from the mesial edge of the root to the mesial edge of the instrumented canal. D1 is the shortest distance from the distal edge of the root to the distal edge of the uninstrumented canal and D2 is the shortest distance from the distal edge of the root to the distal edge of the instrumented canal. CT = 0 represents lack of transportation, CT <0 represents transportation to distal direction, and CT >0 represents transportation to mesial direction. Canal centricity [Figure 1] and [Figure 2] was calculated using the following equation: CC = M1 − M2 whole divided by D1 − D2. CC = 1 μm indicates perfect centralization and CC <0 indicates a lower capacity to maintain itself in central axis. The RDT was calculated at 3 mm, 5 mm, and 8 mm from the apex. At the three regions thickness of the buccal, lingual, mesial and distal walls were measured to determine the pre and postinstrumentation values. The data for the CT, CC, and RDT was analyzed using Wilcoxon signed-ranks test. For comparing values within the group, Kruskal–Wallis test was used IBM SPSS (Statistical Package for the Social Sciences) version18; (Chicago, U.S.A.). CT was assessed from the applied formula and direction of transportation was detected from the total values obtained. Percentages of changes produced were recorded [Graph 1]. CT was seen in all the groups with statistically significant difference between the groups (P < 0.05). There was no statistically significant difference between Groups I and II at the coronal- and middle-third. Group I, One Shape, showed transportation more to mesial side at coronal-, middle-, and apical-third. Group II, WaveOne, showed transportation to distal side at middle- and apical-third. Group III, ProTaper, showed lack of transportation at the middle-third. At the apical-third, Group III, Group II and Group IV showed more transportation. There was statistically significant difference between all the groups (P = 0.000) [Graph 2]. Perfectly centered canals coronoapically was not shown by any of the groups. Canals were mesially centered in all the groups at middle and apical third. Perfectly centered canals were seen in the middle region of canals instrumented with Group III and in the apical region of canals instrumented with Group III and Group IV. 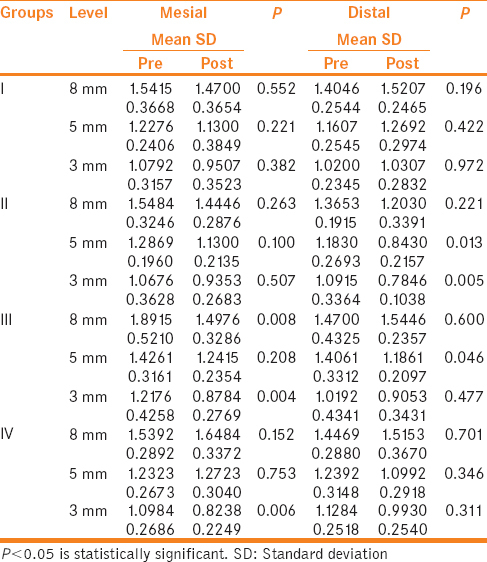 In Group I, RDT showed no significant difference at 8 mm, 5 mm, and 3 mm [Table 1]. In Group II, there was a significant removal of dentin at middle-third (P = 0.013) and apical-third (P = 0.005) on the distal side. In Group III, there was a statistically significant removal of dentin at coronal (P = 0.008) and apical-third (P = 0.004) mesially and at middle-third (P = 0.046) on the distal side. In Group IV, statistically significant difference was seen only in the apical-third (P = 0.006) on mesial side. Excessive dentin removal was seen in Group III followed by Group II and Group IV and no significant change was observed in Group I.
Multifile NiTi and single-file NiTi systems are used widely for shaping the curved canals.,, Single files have the advantages of increased fatigue resistance, reduced cross contaminations, reduced chairside working time and are more economical.,, This study was done to evaluate and compare the efficiency of two single-file systems One Shape and WaveOne. ProTaper Universal multifile rotary system in use over years was used as positive control and SS Hand K-file system was used as negative control for this study. Danger zone in mandibular molars refers to the thinner dentinal wall in the distal aspect of mesial root which forms an area more prone to strip perforation., For this study, mesial roots of mandibular molars with 20°–35° curvatures which are quite difficult to instrument were selected using Schneider's method. 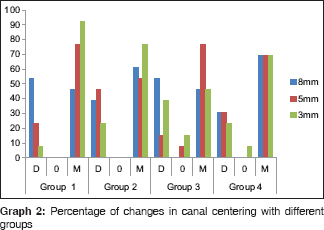 Morphometric changes in the canals after instrumentation can be efficiently studied by comparing the pre- and postinstrumentation canal changes. Among the advanced techniques, Micro-CT and CBCT helps in the three-dimensional view of the root canal without causing damages to the samples.,, Using CBCT, horizontal and vertical dimension of root canals can be assessed accurately., One of the problems that affect the image quality with CBCT is the scatter and beam hardening caused by high-density neighboring structures. If the scattering and beam hardening is close to tooth under evaluation, the resulting image may be of minimal diagnostic values. 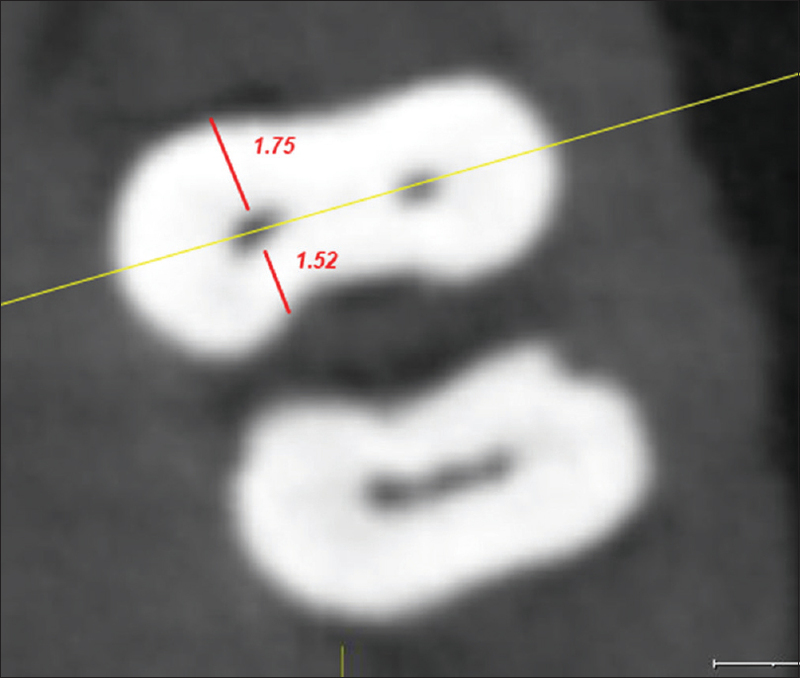 In this study, the CBCT was used to select the mesial roots with severe curvature and also to detect changes in original canal patterns following instrumentation in terms of CT, CC, and RDT assessed at 3 mm, 5 mm, and 8 mm from the apex. Group I was instrumented using One Shape single-file system with 6% taper, made up of conventional Austenite 55 NiTi which works in continuous rotation. In this study group I, One Shape file system showed CT toward the mesial side at the coronal, middle, and apical region [Graph 1]. Less centered canal preparation was detected at the three levels. At the coronal region, canals were centered on the distal side and toward middle and at apical third, they showed centering toward the mesial side. These files showed better-centering capacity at the middle- and apical-third (92.3%). These results were similar to the results obtained in the previous studies., It may be because of the three sharp triangular cutting edges in the apical third, modified triangular cross-section at middle third, and an “S”-shaped cross-section with two cutting edges near the shaft.,,, RDT showed no statistically significant changes (P > 0.05) at the three levels, suggesting no excessive removal of dentin [Table 1]. Similar results were seen in previous studies.,, According to these studies, the lesser changes produced may be due to the variable pitch, noncutting safety tip and three variations in cross sections along its active length which may help in eliminating threading and binding of instrument thereby reducing the screwing effect. Group II instrumented using a WaveOne file, works in reciprocation with 160° CW and 41° counter-CW motion. This file has left angled working blades made using the M wire alloy by the thermal treatment processing to the NiTi wire blanks. M wire is known to improve the cyclic fatigue, torsional resistance, and life of the file and therefore is suitable for instrumentation of severely curved canals., Previous studies have shown the WaveOne files in producing better-centered preparations with lesser transportations., However, in this study, WaveOne file system transported the canal to distal side at the middle and apical region [Graph 1]. It showed lesser ability in producing centered preparations and showed deviation to the mesial side at all the three levels [Graph 2]. It also caused excessive removal of dentin from the middle and apical region on the distal side indicating higher chances for thinning of the dentinal walls [Table 1]. This result was in agreement with some previous studies.,, According to these studies, the excessive removal of dentin using this file may be due to the increased core diameter, increased taper and increase in the stiffness at apical 5 mm of this file. Group IV instrumented using SS K-files in the crown-down technique showed transportation of canals toward the distal side at middle-third region and toward the mesial side in the coronal and apical region [Graph 1]. It produced mesially centered preparations at the coronal, middle, and the apical region [Graph 2] as reported in previous studies. Excessive dentin was removed on the mesial side at apical third. It can be due to the shape memory of SS files. They tend to revert to straight shape leading to the excessive removal of dentin. Evaluation of the results for CC showed a statistically significant difference between all the groups (P < 0.05). Perfectly centered canals coronoapically was not shown by any of the groups. Group I – One Shape and Group II – WaveOne showed mesial centering of canals at the middle and apical region. The results for RDT in Group II, WaveOne, showed the significant removal of dentin at the middle-third and apical-third on the distal side. Group III and IV showed dentin removal at the apical-third region mesially. Excessive dentin removal was seen with Group III – ProTaper, followed by Group II – WaveOne and Group IV – Hand files. Within the limitations of this in vitro study, it can be concluded that the two single-file systems compared showed changes in canal geometry. Among them, One Shape file in rotating motion prepared canals with fewer changes in canal anatomy than WaveOne file in the reciprocating motion. Ingle JI, Bakland LK, Baumgartner JC. Ingle's Endodontics. 6th ed. Hamilton, ON: B.C. Decker; 2008. p. 573-87, 800-10, 813-66, 909-15, 919-53, 942-3,992-1011. Haapasalo M, Endhal U, Zandi H, Coil JM. Eradication of endodontic infection by instrumentation and irrigation solutions. Endod Topics 2005;10:77-102. Çapar ID, Arslan H. A review of instrumentation kinematics of engine-driven nickel-titanium instruments. Int Endod J 2016;49:119-35. Dhingra A, Srivastava P, Chadda D, Banerjee S. Simplify your endodontics with single file systems-case reports. J Dent Sci 2013;6:44-51. Ruddle CJ. Endodontic canal preparation: Wave one single file technique. Dent Today 2012;16:22. Dhingra A, Kochar R, Banerjee S, Srivastava P. Comparative evaluation of the canal curvature modifications after instrumentation with one shape rotary and wave one reciprocating files. J Conserv Dent 2014;17:138-41. Kumar SR, Gade V. Single file niti rotary systems. Int J Med Dent Sci 2015;4:701-7. Thompson SA. An overview of nickel-titanium alloys used in dentistry. Int Endod J 2000;33:297-310. Santa-Rosa J, de Sousa-Neto MD, Versiani MA, Nevares G, Xavier F, Romeiro K, et al. Shaping ability of single-file systems with different movements: A Micro-computed tomographic study. Iran Endod J 2016;11:228-33. You SY, Kim HC, Bae KS, Baek SH, Kum KY, Lee W, et al. Shaping ability of reciprocating motion in curved root canals: A comparative study with micro-computed tomography. J Endod 2011;37:1296-300. Jain PR, Chandra A. Comparative analysis of canal centering ability of different single file systems using cone beam computed tomography-an in vitro study. J Clin Diagn Res 2015;9:6-10. Baek JY, Yoo HM, Park DS, Seok TS, Kum KY, Shin SY, et al. Comparison of the shaping abilities of three nickel-titanium instrumentation systems using micro-computed tomography. J Dent Sci 2014;9:111-7. Kartal N, Cimilli HK. The degrees and configurations of mesial canal curvatures of mandibular first molars. J Endod 1997;23:358-62. Filho PF, Letra A, Menezes R, do Carmo AM. Danger zone in mandibular molars before instrumentation: An in vitro study. J Appl Oral Sci 2003;11:324-6. Abella F, Morales K, Garrido I, Pascual J, Duran-Sindreu F, Roig M. Endodontic applications of cone beam comuted tomography: Case series and literature review. G Ital Endod 2015;29:38-50. Micro Mega. Available from: http://www.mmb@micro-mega.com: OneShape: Completecanalshapingwithonlyone singlefileincontinuousrotation. DOA: 15.12.2014. [Last accessed on 2018 Jun 24]. Bürklein S, Benten S, Schäfer E. Shaping ability of different single-file systems in severely curved root canals of extracted teeth. Int Endod J 2013;46:590-7. Berutti E, Chiandussi G, Paolino DS, Scotti N, Cantatore G, Castellucci A, et al. Canal shaping with waveOne primary reciprocating files and proTaper system: A comparative study. J Endod 2012;38:505-9. Naseri M, Paymanpour P, Kangarloo A, Haddadpur S, Dianat O, Ketabi MA, et al. Influence of motion pattern on apical transportation and centering ability of waveOne single-file technique in curved root canals. Dent Res J (Isfahan) 2016;13:13-7. Ceyhanli KT, Kamaci A, Taner M, Erdilek N, Celik D. Shaping ability of two M-wire and two traditional nickel-titanium instrumentation systems in S-shaped resin canals. Niger J Clin Pract 2015;18:713-7. Capar ID, Arslan H, Akcay M, Uysal B. Effects of proTaper universal, proTaper next, and hyFlex instruments on crack formation in dentin. J Endod 2014;40:1482-4. Yang GB, Zhou XD, Zheng YL, Zhang H, Shu Y, Wu HK, et al. Shaping ability of progressive versus constant taper instruments in curved root canals of extracted teeth. Int Endod J 2007;40:707-14. Vaudt J, Bitter K, Neumann K, Kielbassa AM. Ex vivo study on root canal instrumentation of two rotary nickel-titanium systems in comparison to stainless steel hand instruments. Int Endod J 2009;42:22-33. American Association of Endodontists. Glossary of Endodontic Terms. 8th ed. Chicago: American Association of Endodontists; 2012. p. 48.